Enjoyed thoroughly. Especially enjoyed lunch in a non touristy restaurant. Our day in Buenos Aires with Patrick was delightful, enriching and fun. Patrick's knowledge of the area, his balanced personality, helpfulness and caring qualities made for an much appreciated experience. Patrick, our personal guide was absolutely excellent. We had a wonderful experience with him. We used Patrick Lataillade owner of Buenos Aires Tourning on October 26-27 2017. He picked us up promptly and we set out for a full day city tour. It was immediately clear we had a professional who took us to all the places on our list as well many that we would never have known to explore. 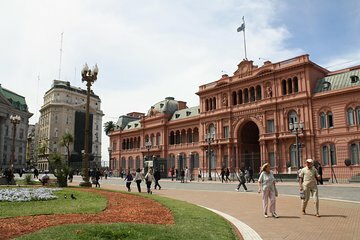 From Casa Rosada Pink Palace to Caminito a colorful street full of artist and cafes started by artist Benito Quinquela Martin in the 60s it is not to be missed. We visited Paseo del Rosedal Rose Garden Walk where all colors of Roses were in bloom. This park created in 1914 was immaculate and beautiful. You could stay for hours taking in the colorful flowers and trees. Our second day with Patrick was a trip North to the Tigre River Delta up North. A quick drive with much to see. We took a boat ride on the Paranara river where people live in small houses accessible only by boat. It was so much fun and the town has many outdoor markets with shoppes of all sorts. A cool bohemian feel with all sorts of products to buy. He made our short stay in Buenos Aires priceless! Patrick, our guide, did a fantastic job of touring us around Buenos Aires, Argentina. He asked us prior to travel what we were interested in seeing and planned our whole day around that with other places of interest as we traveled. He was very knowledgeable about the history of Buenos Aires and Argentina and incorporated that information into the tour. He didn't rush us at all and appeared to let us take the lead as we saw as much as possible of the city in a few hours. We had a plane to catch and he got us to the airport in plenty of time. He was very courteous. We would highly recommend him to anyone. Patrick really understand what we need and make a fantastic trip for us. Great day in the city I didnt enjoy much otherwise. Patrick is really kind and really flexible to adjust the tour depending on your wish list we saw most of the important sights and yet focused on the area and parts of my interest being more into architecture, culture. Patrick being European yet living long in Buenos Aires is perfect match to bring you Buenos Aires closer yet seeing it from different corner that locals might do. The whole day was really pleasant, I felt safe and really recommend it. He also spoke Spanish to me all the time upon my request as I wanted as well to improve my and was really patient while I was trying to find the right words. Many thanks! Patrick was excellent and very knowledgeable. He took us to all of the key sites/areas and also gave us recommendations/suggestions for the rest of our stay in BA. Highly recommended.